REVIEW: David Soren has had his hands in the creation of Shark Tale, Madagascar videos and television shorts, and Over the Hedge. Now he hits the big time as the director for an animation bout a snail who dreams of speed. Building a shell for the slug is Jack the Giant Slayer scribe Darren Lemke and Big Fan writer Robert D. Siegel, focusing on a little snail that could. Theo (Ryan Reynolds, The Croods) is a normal garden variety garden snail. He dreams of going fast, following in the footsteps of his idol and legendary Indy car driver Guy Gagne (Bill Hader, The To-Do List). His brother Chet (Paul Giamatti, Rock of Ages) tries to get Theo to stop thinking about speed and to start thinking about what all other snails think about - tending to the garden and harvesting tomatoes. When an accident makes Theo reassess his slow life, he finds himself injected with nitrous oxide which gives him super speed. Both Theo "Turbo" and his brother are found by a taco seller named Tito (Michael Pena, Gangster Squad) who dreams of making his and his brother Angelo's (Luis Guzman, The Last Stand) taco stand successful. When Tito finds out about Turbo's speed, he and the snail decide to enter Turbo in the Indianapolis 500 race to gain exposure and acclaim! Dreamworks has a knack for creating unique and interesting animated stories. While Disney Pixar seems to have started to rely on sequels like toy story and spin-offs like the upcoming Planes, dreamworld has dazzled with their recent efforts. Turbo is no exception. Taking a story of a snail that wants to race seems absurd, but they make a great story out of it anyway. Turbo has a silly cast of characters, especially when dealing with snails. Even though turbo has NOS speed, that doesn't stop other 'need for speed' snails from slithering out of the woodwork. Led by Whiplash (Samuel L. Jackson, The Avengers), Turbo encounters Smoove Move (Snoop Dogg, Starsky and Hutch), Burn (Maya Rudolph, The Way Way Back), Skidmark (Ben Schwartz, The Other Guys), and White Shadow (Mike Bell, Kung Fu Panda 2). All of them are decked out in racing strips and tail fins. Joining the snails are a human cast of characters that seem to have move faith in a turbo-charged snail than Theo's own brother. Tito recruits the other owners in the starlight plaza, including auto mechanic Paz (Michelle Rodriguez, Fast and Furious 6), hobby store owner Bobby (Richard Jenkins, Killing Them Softly), and nail stylist Kim Ky (Ken Jeong, Despicable Me 2). The animation is dazzling, on par or better than the raceway created on Disney's Cars. From the grooves in the track, to the camera work around and under the other Indy cars, to the discarded tire rubber 'pebbles' on turn four, Turbo does not disappoint. 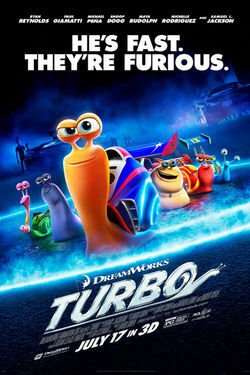 No where near photo realistic, Turbo lets the snails and their human counterparts take on their characters with their voices. The snails are cute and loveable, each with an unique look. The streak trail that Turbo leaves behind is a character all its own, allowing Turbo to speak to Tito in pictionary format when the snail needs to get his point across. When you are a snail that dreams of speed, you are an outcast from the rest of the snail world. 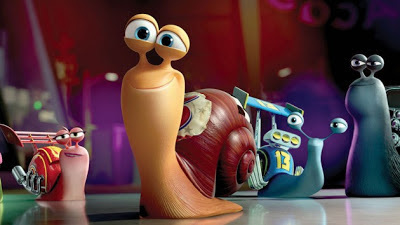 When dreams come reality, Turbo still finds himself a loner until he meets other snails that share his racing vision. At the end of the day, though, Turbo must rely on his own heart and spirit - not turbo-charged speed - if he is to get the job done. Turbo is a fun ride for kids and adults. 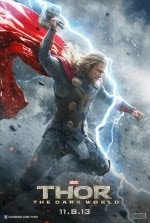 Silly, well-rendered, and having a great story of heart and of following a dream, this film will get your motor running.